HOW SERIOUS IS ACADEMIC FRAUD IN OUR UNIVERSITIES? More than a month ago, on the 11th of June, 2016, the Faculty of Medicine at the University of Malaya was alerted of alleged academic misconduct on the part of some faculty members who were authors / co-authors in a number of scientific publications. To its credit, the University quickly convened an investigation and found that ‘there were duplication and / or manipulation of almost all the figures (images and graphs) within the original Scientific Reports paper and across three other publications authored by the group of researchers” and called for the authors to retract all four articles. The articles were subsequently retracted by the journals in question. The university’s quick and decisive action sends a strong signal that research fraud is not tolerated in our national research universities and it should be applauded accordingly. But larger questions regarding academic integrity and academic fraud remain unanswered. For example, this specific case of academic fraud was discovered not by an internal probe within the university but because of scrutiny by academics and researchers from outside the country. The allegations which were first highlighted on twitter was then picked up by blogs such as Microbiome Digest, For Better Science and Science. Elisabeth Bik, a Stanford researcher who recently co-authored a paper titled “The Prevalence of Inappropriate Image Duplication in Biomedical Research Publications”, suggested on Microbiome Digest that not only were the images duplicated within each paper, but that the figures look very similar across papers (despite the papers being about different cancer cells and different compounds!). Without such scrutiny, would this academic fraud have been discovered? In addition, were the authors in all four papers (other than Nina Samie who was the lead author in all of the papers) aware that the same study was replicated thrice and submitted to four different journals under different titles? Was there academic fraud not just in terms of the content published but also in the manner in which the different co-authors may have been duped or worse yet, were complicit partners in this scandal? What is disconcerting is that this specific case may be the tip of the iceberg of what is poor academic integrity and honesty in our higher education system. While I believe that a large majority of the 3823 papers which were published by UM students and staff in indexed journals have been done with academic integrity and honesty, it only takes a few bad apples to spoil the barrel. I have heard of instances of junior faculty and researchers being forced to include the names of their supervisors on academic papers even though their supervisors did not contribute any significant intellectual input or work. Some supervisors even insist of being named as first author which implies that he or she took the leading role and did much of the work for the publication in question. In some worse cases of academic fraud, some senior academics even refuse to allow the junior faculty or researcher to put their name in the publication thus claiming all the intellectual credit for himself or herself. It is not sufficient for UM to merely issue a press statement on this specific instance of academic fraud. As the oldest and arguably most prestigious academic institution in Malaysia, it should take a leading role when it comes to upholding standards of academic integrity and intellectual honesty. 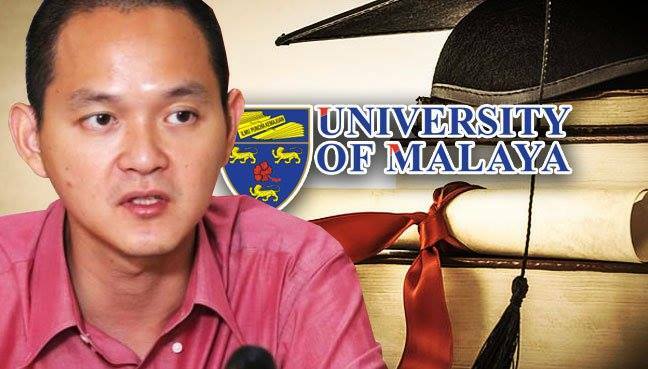 As such, I call upon the University of Malaya to publish the full proceedings of its internal investigation into this matter and to recommend changes to existing guidelines so these kinds of cases do not happen again. In addition, UM should also disclose the exact nature of the punishment meted out to the researchers in question so as to send a strong signal to other faculty of the serious consequences of academic fraud. In addition, I call upon the Minister of Higher Education, Idris Jusoh, to conduct a comprehensive review of the High Impact Research (HIR) initiative between his Ministry and the University of Malaya. The authors of three of the papers received two research grants from this initiative which is a collaboration between the Ministry of Education and the University of Malaya to fund projects that will lead to publications in Tier 1 ISI/Web of Science journals. According to the UM 2014 annual report, the Ministry of Education (MoE) has injected RM590 million into the programme, with additional funding from UM, to fund research projects up till 2016. Given the large amount of funds dedicated to this initiative and that the fact that two of its research projects were found to be academically fraudulent, it is in the public interest for the funding for all the projects under this initiative to be publicly disclosed and reviewed. If Idris Jusoh is serious about ensuring that our higher education system is ‘Soaring Upwards’, he should take this matter seriously and not try to cover things up.